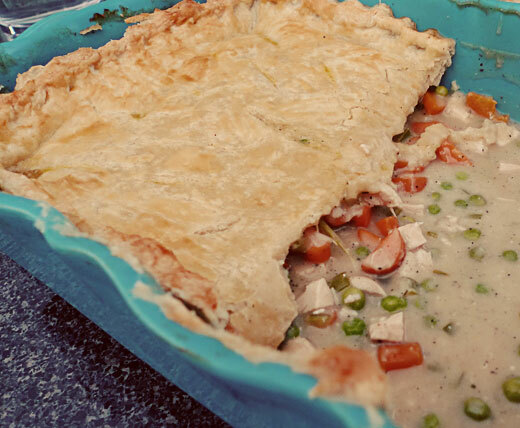 This is probably my favorite comfort food, this amazing chicken pot pie. I got the recipe from Annie; she is the queen of chicken pot pie. (See her post about it here, her photos are a bit more appetizing than mine). Besides the fact that this chicken pot pie is so wickedly delicious and my husband could eat a whole pan by himself, I love that I can make it a day ahead and just pop it in the oven when I'm ready for dinner. To start, make your pie crust. My favorite crust is Martha Stewart's Perfect Pie Crust. One batch makes just enough for a 9x13 casserole dish, though I prefer to use salted butter and a little less flour. For chicken pot pie, I usually do 1 1/2 batches, cutting the extra dough into triangles and baking separately, because there is never enough crust to go around. (Did I take a picture? No. I was too busy eating them.) If you prefer to use another crust recipe or store-bought pie dough, just make sure you have enough for 2 regular pie crusts. 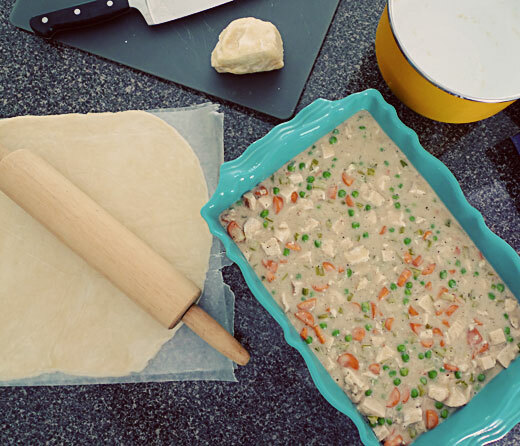 Prepare your pie dough and refrigerate while you make the chicken pot pie filling. Very gradually add 32 oz of chicken broth, mixing well after each addition. Simmer until everything is hot and adjust all seasoning to taste (For real. Don't be afraid to add more.) Fill a 9×13 casserole dish or two small ones or whatever it fits in. Roll out refrigerated pie dough (I like to roll out my dough between 2 pieces of wax paper, makes it easy to transfer the dough and easy to clean up), and cover filled casserole with crust. Press or pinch to seal the edges, then cut a few pretty slits in the middle to allow steam to escape. (Again, sorry for the lack of pictures, my hands were a bit messy at the moment.) Wrap well with plastic wrap and refrigerate until ready to bake. Bake for 30 minutes at 400 degrees or until edges turn golden. Let sit 10 minutes before serving. Serves 4-6. I can officially get excited about this because my gluten free blogger posted her recipe for gf puff pastry today! !